The inquiries addressed by agents generally follow a specific workflow. Extensive studies and research shows that most of the calls received by agents are related to routine tasks. Repetitive jobs are a common cause of employee boredom and under utilize human resources. They can be better handled by bots, so employees can focus on decision-making tasks that require human supervision. To attend to this huge volume, companies have no choice but to put incoming customers in lines waiting for their turn to speak to an agent. By employing chatbots to deal with this volume, companies can rein in the cost of setting up and training support agents. From a customer’s point of view, he is speaking to the company and does not understand why he has to wait while the call gets transferred between departments. He expects the first agent he speaks to, to resolve the issue. However, the biggest technology challenge that telecom companies face today in having a single view of the customer is that their departments are quite siloed. There isn’t a smooth flow of information from one department to another. Employees are looking after difference processes and there is usually a lag during the call transfer. 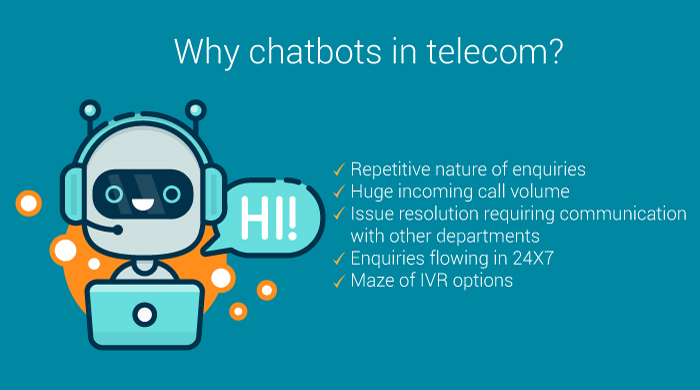 A chatbot, on the other hand, is directly connected to all the processes internally and can resolve issues spanning different departments with ease. For the customer, the experience is much smoother. It is unrealistic for a company to offer a 24 x 7 available support system, with an ever-growing base of customers. Chatbots are the least expensive and most effective tools to address this need in the telecom industry. To understand how chatbots can help you in your company, you can reach out to Geckolyst.com.